Ready, Set, Ski! Recent snowfall and cooler temperatures have come just in time to welcome Winter and issue a start to the 2018/2019 ski season at Blacktail Mountain Ski Area (BMSA). With North-facing terrain, typically BMSA receives snow earlier and keeps it later than most other ski areas/resorts, but it’s been a mild start for snowpack this season. BMSA does not rely on snow making machines to lend a hand to the snowpack, they are reliant on good ole’ Mother Nature. BMSA feels the natural snow is well worth waiting for, because machine-made snow, although it comes close is never quite the real thing. BMSA does not set a preconceived calendar open date, which enables management and maintenance to lovingly care for every inch of snow until it’s ready to properly slide upon. BMSA is hopeful to open 100% of its’ terrain this Saturday, but does need some additional snow in order to do so. Luckily, there’s moisture and cooler temperatures in the forecast for this week, so do your snow dance, burn some old skis or partake in whatever ritual you think may appease the snow gods to grant us with some fresh pow-pow for opening weekend. Easy access from Hwy 93, turn West in Lakeside, follow the Blacktail Rd, 14 miles to the mountaintop. 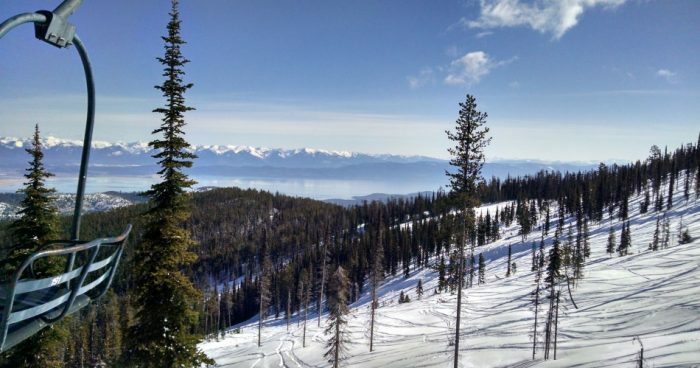 In driving to the mountain top, regardless of whether you are an expert or novice skier/snowboarder, everyone starts at the top on Blacktail Mountain. Views from Flathead Lake to Glacier Park and of the Mission, Whitefish and Cabinet Ranges surround. With our lodge and parking located at the top of the mountain, even beginners get to experience the best snow and spectacular views. At Blacktail, step out of your car and get a top to bottom run in before riding a chair! Lifts spin: 9:30 a.m.-4:30 p.m.
*Ski FREE on your Birthday! Newly gladed terrain was added extending the Lower Salmon run and additional glading was completed between West Ridge and Buck Snort. Punch Cards are available for purchase at the Sportsman Ski Haus in Kalispell & Whitefish. Punch Cards are designed with the frequent skier in mind and offer 4 days of skiing for only $140.